So after wandering around Times Square in an attempt to find a Thai place I wanted to try after spotting the restaurant last August as duriandave took me for Indonesian food in the area, I headed to the Pacific Place mall. Okay, before I get into the nitpicking, I have to ask why was this film at Pacific Place so crowded on a Sunday night and why was the audience predominantly white people? I mean, Crossing Hennessy (2010) is a decidedly local film, isn't it? Or does Tang Wei's past work with arthouse director Ang Lee guarantee her some sort of crossover appeal to gweilos? Or were the audience members all local expats so happy to see a film that was about their home that they came out to see how the places looked on the big screen? Or do the sort of people who shop and eat at Pacific Place simply support going to the movies more than people in other parts of the city? Whatever the reason, it was a surprise to me after being the only non-Asian guy in most of the sometimes half-empty film theaters I've been in in this place. Ross has a review that says what needs to be said about the weaknesses of Crossing Hennessy so I'm not going to reinvent the wheel here. 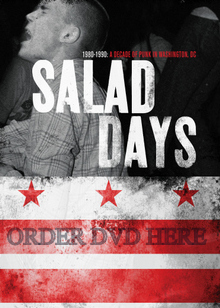 I think if I had watched this film at home, I would have liked it more -- seen it as a travelogue from a place I missed, or something. 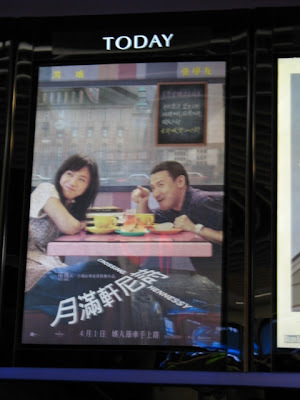 But, as it is, it felt too long and ordinary despite the fact that Jacky Cheung is usually decent and Tang Wei was quite natural and charming. In the few minutes I had to kill before the film started, I hit Hong Kong Records and found a lot of good Shaw titles. As my paws clutched a sealed copy of The Five Venoms (1978), I think I may have let out an audible squeak. Not that I love the film but it's friggin' rare as heck! I think I may have to keep that one sealed. Somewhere in that pile is a sealed copy of Twinkle Twinkle Little Star (1983) -- Brian, you can have your copy back! And, there's a copy of Umetsugu Inoue's Sunset (1971) too! 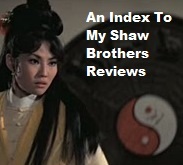 Yes, I actually have more Shaw Brothers titles to now review for the blog! Will I lose the 5 regular readers I already have? There's a Cecilia Cheung poster/DVD thing that was severely marked down so I had to get it. And dleedlee, there's a Zhang Jingchu title there that you've recommended to me twice so I've got that to watch too! Here's a gratuitous shot of Chang Chen and Shu Qi presenting some award at the Hong Kong Film Awards right now. I don't have English subtitles but I can almost follow along by using The Golden Rock's live blog of the event.